You know there are thousands of carriers out there looking for quality drivers like you, but how do you find them, and how do you know if they’re right for you? Generally, you could either google “trucking jobs” and wade through tons of results, not quite sure what to believe, or you could go to a job board site and have your phone blow up with recruiters calling you. Pulse will now give you personalized carrier recommendations, just by tapping on the Jobs button. It still might be hard to find the right job – but we are starting to make it easier. So how does it work? Every time you see a list of recommended carriers, the system compares which carriers you rate high (and low) with tens of thousands of other drivers’ ratings. Then we build a personalized list of Recommended Carriers. The result is that you’ll discover carriers you may not have heard of – and by leveraging the “wisdom of the crowd,” have more confidence about learning more. So now, the same technology that helps you find new restaurants or decide which movie to watch can help you find a new job. Our latest addition to Pulse now gives you the ability to rate a carrier from one to five stars (one being the lowest). The addition of this new powerful functionality helps us to make carrier recommendations that are best suited for you. We base your recommendations not only on your rankings, but also on your activity in Pulse – such as likes, blocks, application history, and other interactions within the app. Pulse also uses the rankings from tens of thousands of drivers like you to supplement recommendations – which means the more carriers you rate, the better your carrier recommendations get. 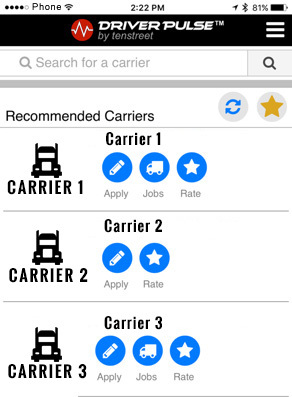 Tap the Refresh button after rating additional carriers and/or updating a carrier rating to show newly discoverable carriers instantly. Tap the Star button to see an alphabetized list of all your rated carriers. You can update them with a simple tap. And the great news? All recommendations are 100% based on driver input. We keep it real and give you honest recommendations, matching you only with carriers that are right for you. We’ve also made it simpler to sign in to Pulse. You can now sign with just your email address and phone number, or get started as a guest and explore the app incognito – the choice is yours. We always like to keep you abreast on what’s up and coming in Pulse. Soon, we will be adding the ability to share jobs, favorite carriers, and help you celebrate that moment you get the job with your friends on social media. Stay tuned!